In A Photographer's Guide to Ohio Ian Adams, Ohio's foremost landscape photographer, guides you to some of the most photogenic sites in the Buckeye State. With 3,600 buildings on the National Register of Historic Places, more than 120 state parks and nature preserves, and the world's largest Amish community, Ohio's photographic subjects are nearly endless. 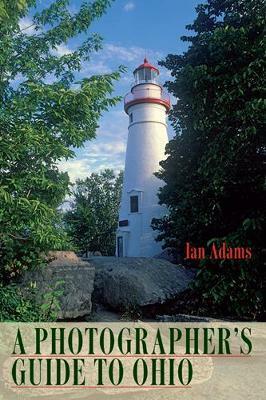 In more than 150 color photographs, Adams shows you how to capture the beauty of the seasons when photographing Ohio's scenic vistas, nature preserves, waterfalls, public gardens, historic barns and bridges, landmark buildings, and town murals. Accompanied by regional maps, each entry includes clear directions and GPS locations, related websites, and historical facts about the area, as well as Adams's detailed suggestions for capturing the best images. Both beginners and experienced photographers will find expert guidance in Adams's clear advice on digital landscape photography and will be inspired to create their own stunning Ohio scenic images. "Few people are more intimately acquainted with Ohio's natural places, its wild life, rural communities, and cities than Ian Adams. And few people are better qualified to record these points of interest and splendor than Ian Adams. A Photographer's Guide to Ohio is engagingly written to help photographers improve their camera skills, but I treasure it most for its beautiful illustrations. Typical Ian Adams-a superb book." -- David Kline, editor of Farming magazine "(A Photographer's Guide to Ohio) is the kind of book that can't be written with only a few months of research. Ian had to draw on all his experience as Ohio's best landscape photographer. That's nearly four decades of hard but rewarding work.... The book ... is equal parts travel guide, digital photography primer, history book, and, last but certainly not least, a compendium on some of the best places to shoot photos in Ohio...." "If your favorite Ohio vacation souvenirs are digital photographs, a new book by Cuyahoga Falls photographer-writer Ian Adams belongs in your camera bag. A Photographer's Guide to Ohio is like having Adams, Ohio's premier landscape photographer, as your travel and photo guide." -- Carl Feather "In his latest book, A Photographer's Guide to Ohio, Adams pulls no punches in his straightforward advice to would-be landscape and nature photographers." "Adams also gives good advice on storing your digital pictures, sharing them, and generally getting full enjoyment from them.... and I am pleased to say there is an extensive index.... If the book is a pleasure simply as a picture book, its stated purpose also is ably carried out." "Nature photographer Ian Adams agrees with me: Ohio is beautiful.... (A Photographer's Guide to Ohio) works as a travel guide, a primer on digital landscape photography or just a fun read about little-seen corners of the state. It includes Ohio regional maps with color-coded photography locations.... (Adams's) terrific images-many of them shot from unusual vantage points-are scattered throughout." "The first-rate book looks at 158 photogenic spots in Ohio (all open to the public). It will be loved by photographers, travelers, history buffs and outdoor lovers. It is stocked with 151 color photographs taken by Adams." "I've always wished I could capture images as vibrant and dynamic as those of Ohio landscape and architectural photographer Ian Adams. Now he's written a book to help me-and others-toward that goal.... Adams' book does serve as a terrific directory to some of the most scenic spots in the state, even if you have no plans to carry a camera, with complete contact information and GPS coordinates."